Eta is a snack foods company based in New Zealand. You know me and snacks, particularly when traveling and they have unique flavors. I couldn't wait to try their goods. 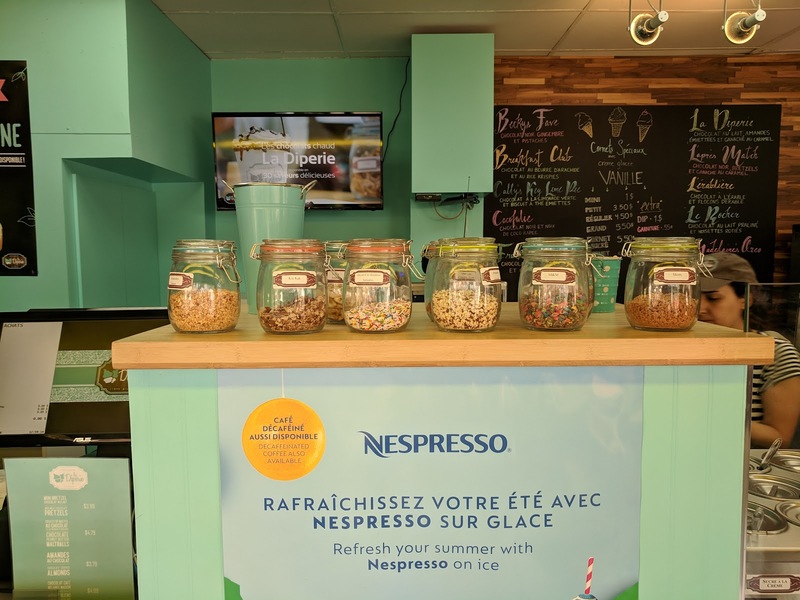 They make a slew of different product lines, including different types of chips (Uppercuts - Deli Cut, Ripple Cut, Thick Cut, Uppercuts - Corn Tapas), specialty chips (Munchos, Cruncheese, Monster Munch, and Cheese Balls), crackers (known as Cravers), and nut mixes (both sweet and savory). Some of the flavors are totally fascinating, like "Cheesy Bacon" or "Burger" Monster Munch, or Sweet Chili Relish Uppercuts Deli Cut. Eta has a long history as a company, 80 years old, although the chips were only introduced in the 70s, the premium Uppercuts line not until 2004. I tried only one item though, from the Ripple Cut line. "ETA real decent chips since the 70's! Made with potatoes proudly grown locally in NZ. All we do is dig 'em up, scrub 'em, chop 'em and cook 'em, that's why our chips have a real, natural golden colour." I loved them. Next time I'm back in New Zealand, I must get my hands on more of their products! What makes up "chicken" flavor? 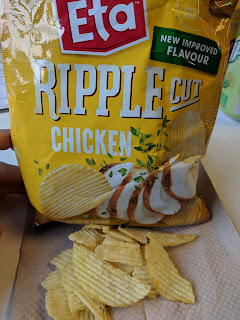 Well, "Chicken Flavour", duh? Otherwise known as Sugar, Salt, Corn Maltodextrin, Onion Powder, Natural Flavours, Garlic Powder, Herbs, Hydrolysed Soy Protein, Milk Powder, Flavour Enhancer (635), Emulsifier (433). Yum. Except, they were actually yum. Really yum. I love these. The ripple form factor was just right, they were thicker than traditional thin style non-ripple cut chips, full of good potato flavor, if that makes any sense. Fried, not baked or trying to be healthy, and very satisfying. And the flavor? Ok, I didn't taste "chicken", but I really liked what I did taste. Full of flavor. So much flavor. Great herb level. I adored these, and downed the bag in an instant. Soft serve ice cream. It is what my summer dreams are made of. Dreams, because in San Francisco, "summer" is a joke, and soft serve just isn't really a thing. Hence why whenever I visit the east coast of the US, or Sydney, all I do is eat soft serve. Such a rare treat for me. 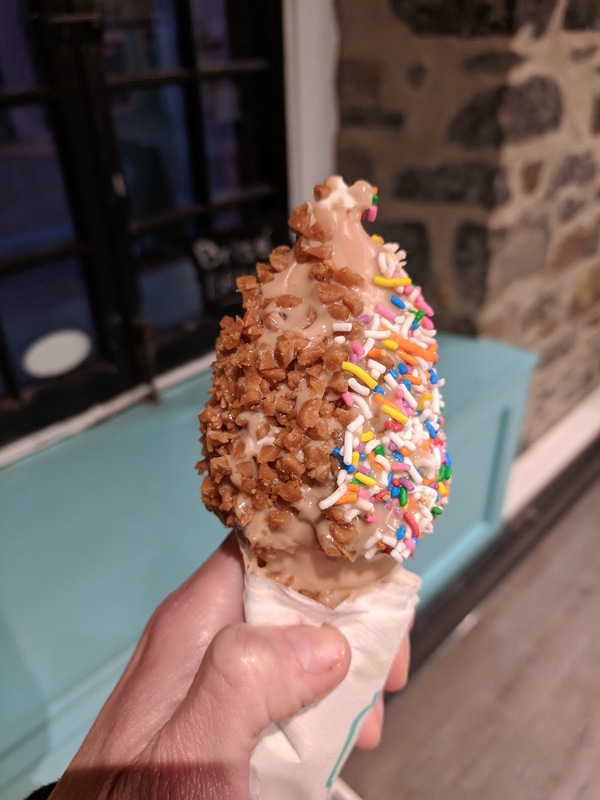 I'm glad soft serve has continued to flourish there though, because the quality of soft serve shops just keeps going up. My childhood haunts of Dairy Twirl and Ice Cream Fore-U just don't compare, not just to crazy Instagram sensational places (yes, I'm looking at you Aqua S and your cones with cotton candy wrapped around them), but even to traditional ice cream stands that have just really increased quality like King Kone, or ones with sourcing you can't beat, located on their own dairy farm with maple sugar shack, like Mac's Maple. La Diperie isn't in my hometown, but rather, in Montreal, where I visited for a very quick 2 day business trip. 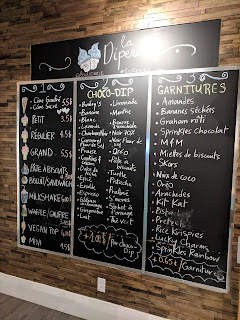 My list of desserts to try included 2 things: BeaverTails and soft serve dip. 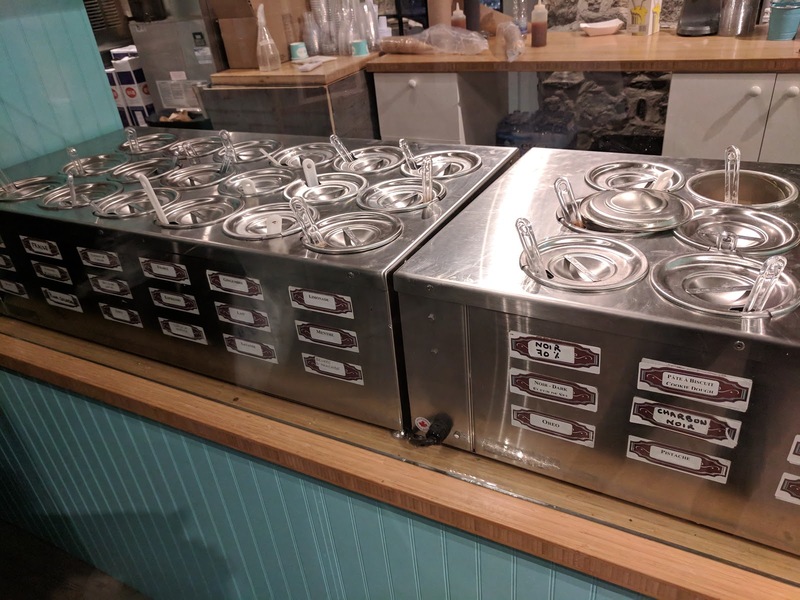 Because, apparently, Montreal takes their soft serve dip very very seriously. 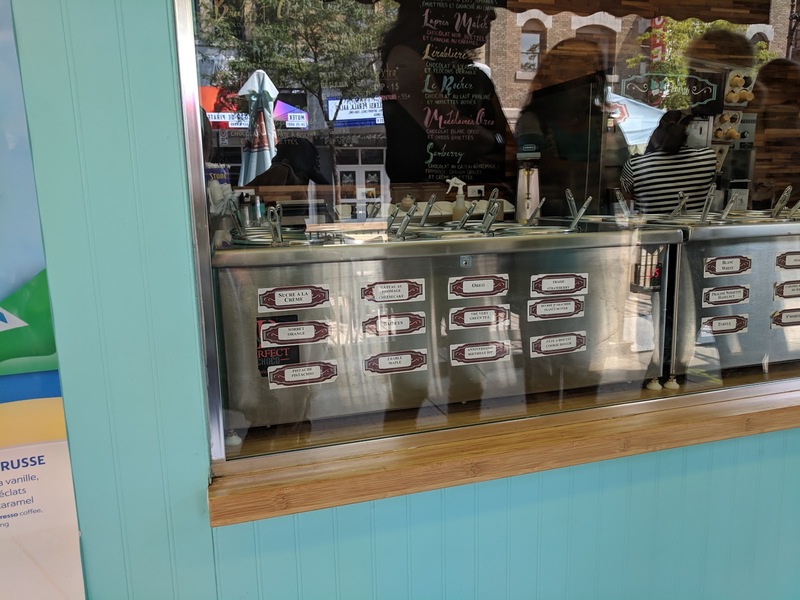 There are sections of town where every third store has soft serve with dips. Seriously. 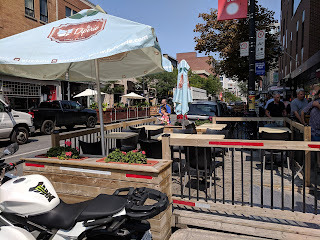 Most look fairly generic, but just my list of places with artisan dips and toppings was at least 10 long, in a few block radius of my hotel. La Diperie is a chain in the area, started only in 2014, but already with 25 locations. There were at least 4 within easy walking distance of my hotel. I visited 2. And returned to one of them within 10 minutes. Uh, yeah. 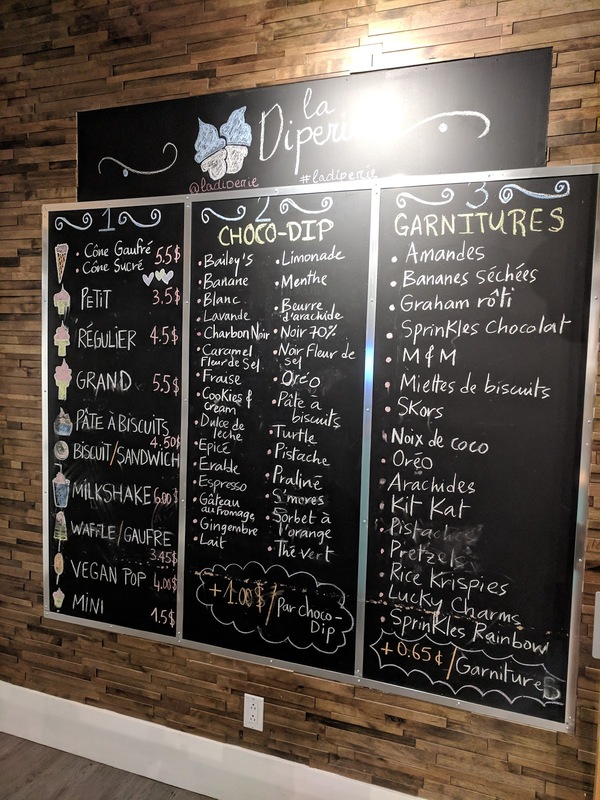 I selected La Diperie for several reasons: large dip selection, full customization allowed (some places are pre-set combos of dips and toppings only), and a great range of sizes, including an adorable mini cone. 2 Visits ... in 10 Minutes. Don't judge. So I went. Twice. In one night. Ok, twice in 10 minutes. Please don't judge. I recommend this move actually. I went to walk around and eat my cone, and realized that the minis really were small enough I could get another. I'm really glad I went with the mini actually, because 2 totally different ones was way more fun that 1 larger one. My server told me this is actually really common, and they recommend it to people who can't make up their mind. Both of my cones were quite successful, and so I decided to check out another location a day later. 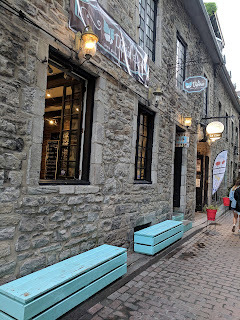 My first visit was to their location in Old Montreal, center of touristville, but, down a side street. This location was down a quiet side street, in a stone building with bright blue planters. Inside is small though, no seating at all, just a place to order and pay and get out. No bathroom facilities. The menu was all in french. I struggled through it, but did ask a bunch of questions. To start, you pick a cone or dish from 5 sizes: mini , petit, regular, grand, and waffle for a base price. From there, you can add a dip for $1, from their extensive line up. And then, toppings for $0.65, again, a decent line up. I love the mini size because if you want just a snack, or a little treat after dinner, its a great size to feel like you had something, but not too much. 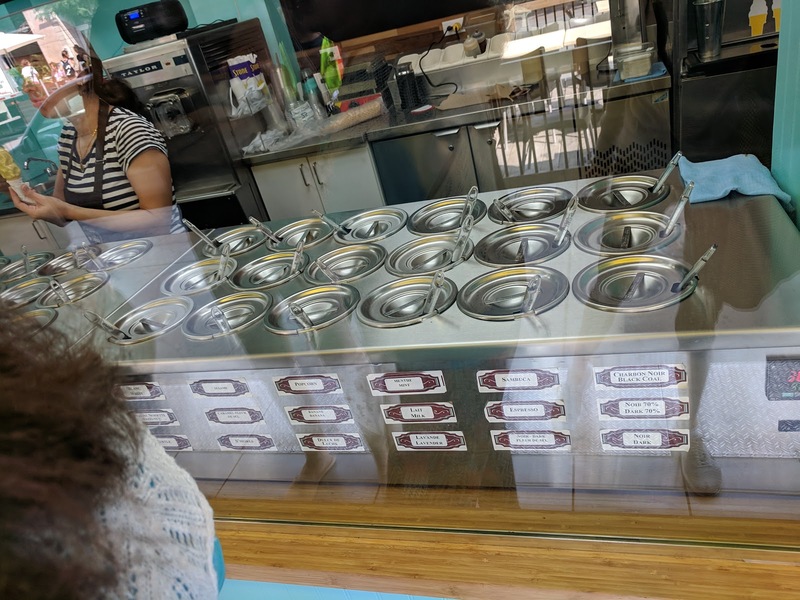 The next size up, "petite", is about the size of kiddie cone at most places, and then they have regular and large sizes too if you want a full treat. I wish more places had something like this. You can also opt for some pre-designed creations with specific dip and topping combos, build your own ice cream sandwiches (pick your cookies, pick your dip, pick your toppings), milkshakes, or, if you are vegan and got dragged here by someone, a vegan popsicle. 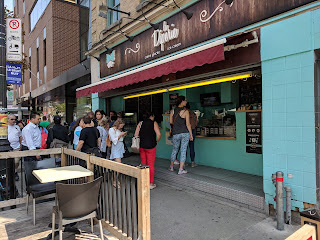 La Diperie has only vanilla soft serve, but it was perfectly creamy and rich, certainly good base soft serve. Some locations also carry other desserts like lava cakes and profitteroles, and raw vegan cookie dough. "More than 30 pure Belgian chocolate flavors to choose from. Great classics such as milk, dark chocolate, caramel or surprising ones, like activated charcoal, ginger, lemonade, lavender, pistachios." Now the hard part. The dips. Yes, literally, 30 of them. Not made from wax and chemicals, but from white chocolate, milk chocolate, dark chocolate, or 70% dark chocolate, although none were labelled with what type of base they used, and I felt annoying asking. Chocolats Favoris labels these nicely. Flavors range from boozy bailey's, to classic dark chocolate with fleur de sel, to kid's favorite Oreo. And yes, you can ask to try them first. Since my visit was at night, I limited myself to the white chocolate based offerings. I sampled a few before making my pick. I was sad that they were sold out of the one I wanted though, a white chocolate based "Birthday Cake" flavor. "More than 20 types of toppings. 20 original and classic toppings to put the finishing touch on your culinary creation!" And then, toppings! All types of nuts (almonds, peanuts, hazelnuts, pistachios, etc), candies (M&Ms, Skors, Kit Kat, etc), cereals (Rice Krispies, Lucky Charms, etc), cookies (Oreo, graham crackers, etc), and many many more. They didn't actually have a full 20 toppings at this location though. 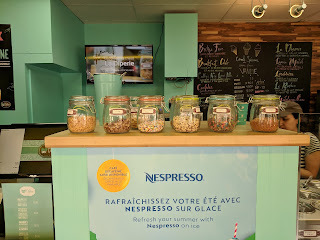 My next visit was to their St Catherine location, 2 days later. 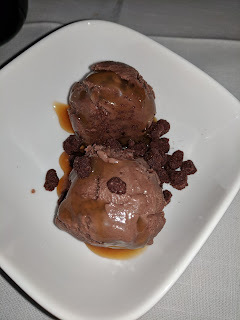 Don't worry, I had soft serve dip the next night too, I just decided to mix it up and go to Chocolats Favoris instead (review coming soon!). 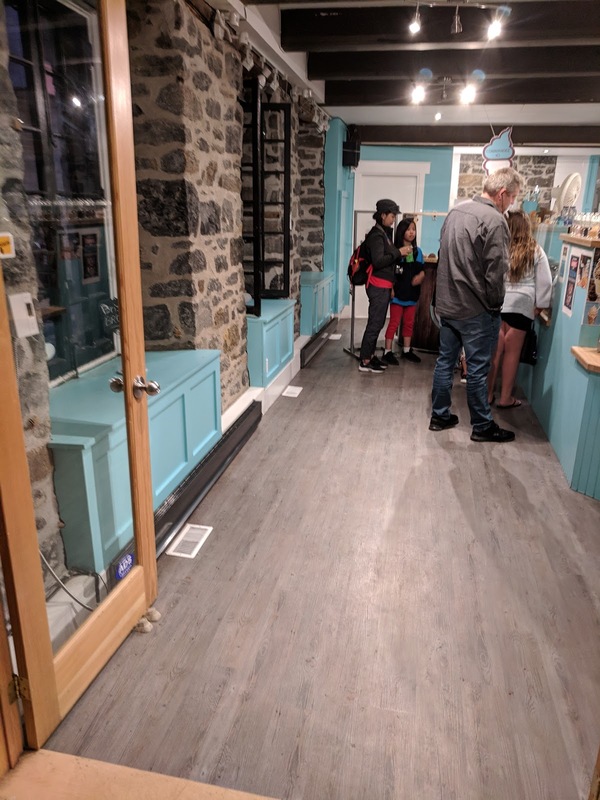 The St. Catherine location was actually a very different experience, with a far bigger menu, dip, and topping selection. This one did have the profiteroles, "Razzles", and other blended items. This location has no interior, just a window on the walking plaza to order. And a line, of course. It does have seating, an outside area on the walking mall closed off with a few tables. And a far bigger dip selection. And this dip selection was arranged starting with white chocolate, then milk, then dark, then 70% dark. So much easier. They had all the same ones the previous location had, plus more that I was particularly excited to see, like the birthday cake that was sold out at the other location. Milk, Dark, 70% Dark Dips. And then, even more milk, dark, and 70% dips. Since this visit was daytime, I opened up to hte possibilities of chocolate, and there were some amazing sounding choices. Popcorn! They also have far far more toppings, two different sets of jars. This set was mostly the same as the other location. But the other side had more fun things, like some unlabeled blue candy things I decided to get. Here you can also see the cone line up. They actually use different size cones for each size, and it was nice to see them side by side. The mini cone is sooo cute. 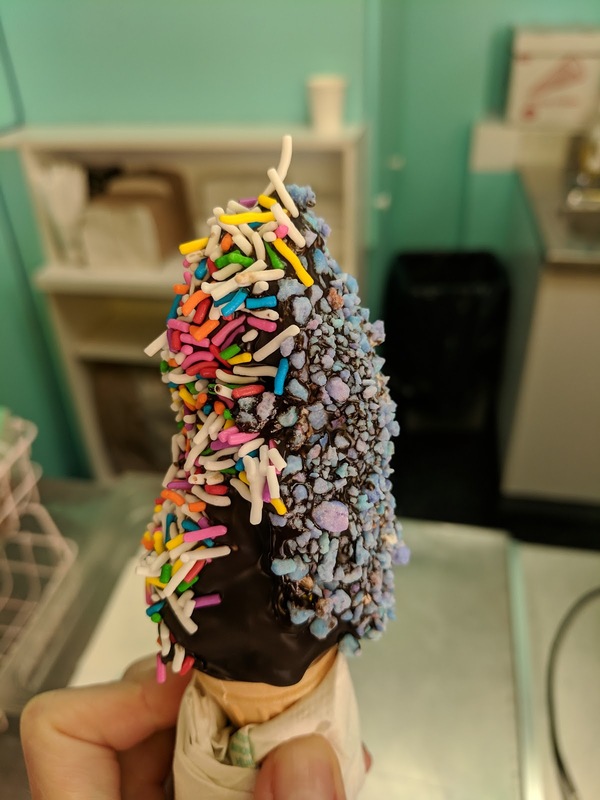 A waffle cone or chocolate waffle cone are also available. At the first location, I got a mini ... and then another mini 10 minutes later as I wasn't quite satisfied (I did want a full size dessert, and, I didn't love my first dip). 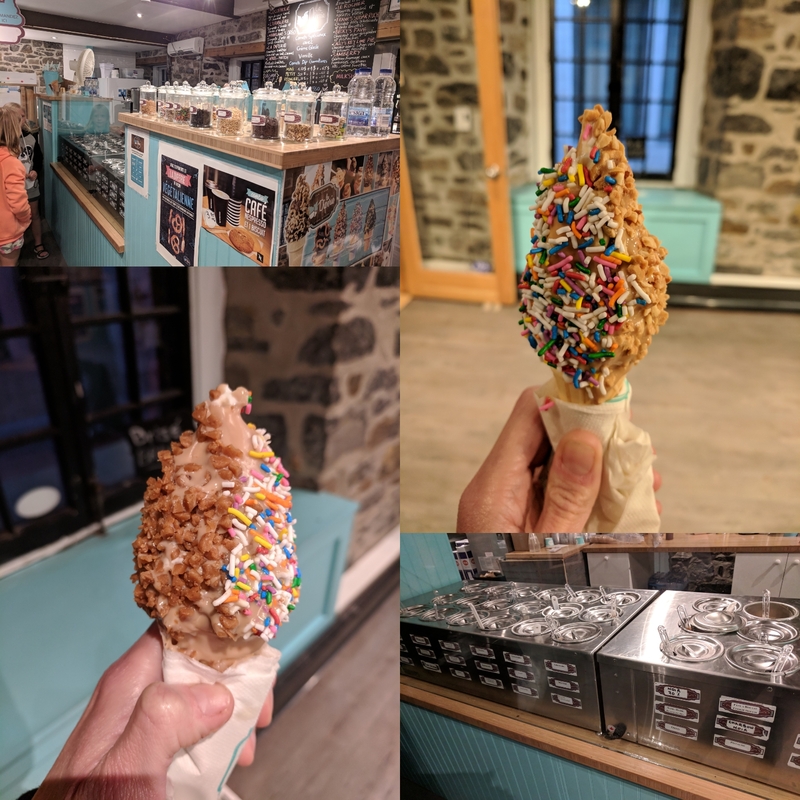 At the second location, I actually had a full dessert prior (oops), but still wanted one last cone, so got another mini. I loved the size. White Chocolate Pistachio: a decent dip that I was worried would be "too much" after a while. White Chocolate Maple: A great sweet maple one that I just wasn't in the mood for. White Chocolate Anniversary Birthday Cake: Pretty color, but didn't taste like anything besides sweet. White Chocolate Popcorn: Didn't taste any popcorn. Was hoping for sweet and salty and that didn't happen. Milk Chocolate Mint: This was good, minty, chocolately. I would have gotten it but I wasn't quite in the mood for mint. A few things were consistent at all locations. First, the base ice cream, only vanilla. The ice cream was good, rich, creamy, and it melted nicely as I ate it. Better than average soft serve really, and it isn't even the focus of the shop. Second, the style of dip shell. 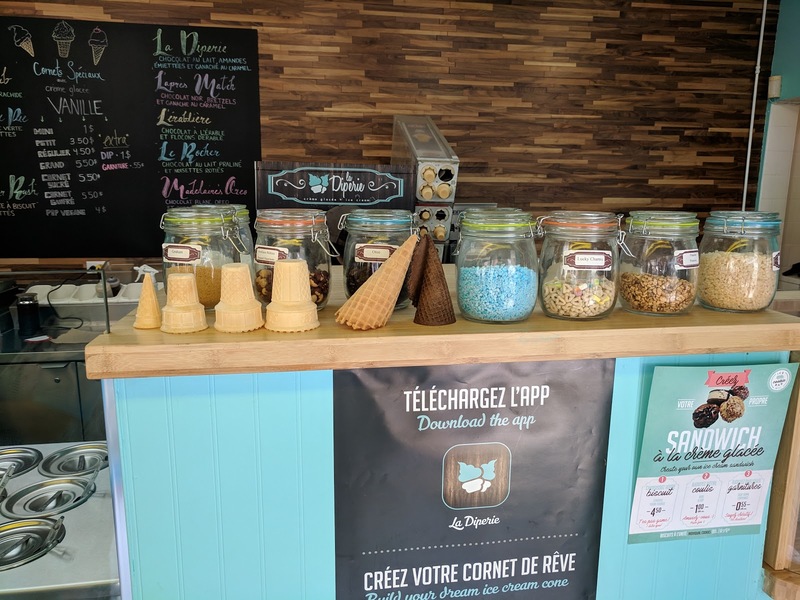 It isn't as thin as ice cream stands that use the commercial waxy chemical shells, but it isn't nearly as thick as other chocolate shops that feature dips. Here you can see how thin the layer is. White Chocolate Peanut Butter Dip, Peanuts, Rainbow Sprinkles. Mini. $1.50 + $1 + $0.65 + $0.65. 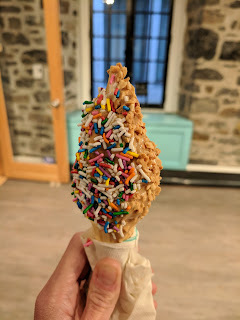 For my first cone, I opted for peanut butter in the end without trying it, since I do always love peanut butter. 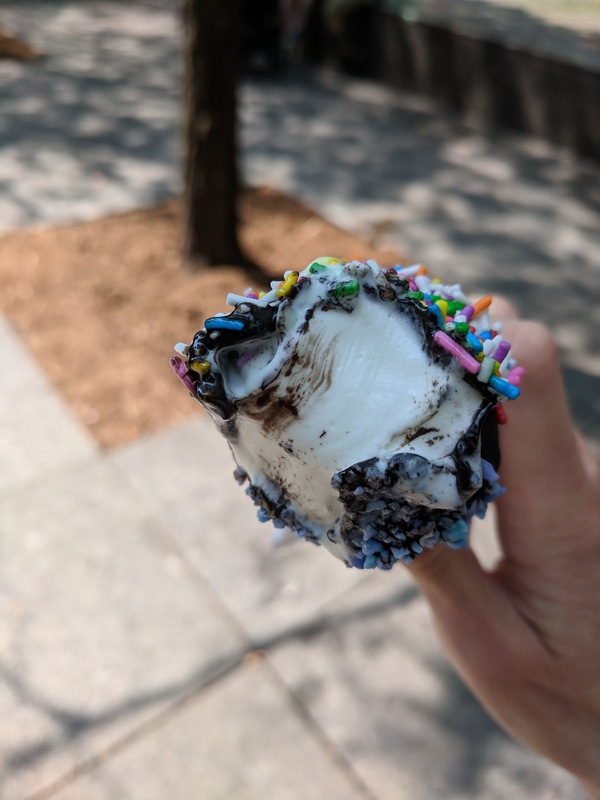 I dipped it in crushed peanuts and rainbow sprinkles. This one was the prettiest, look how perfect it was! The peanut butter I didn't love. It was good, but actually just too intense. Thick, sooo much peanut butter. I did like the crunch of the nuts and the sprinkles on the outside though. I think a thinner layer of dip would have worked fine, maybe a larger size with less surface area outside and more ice cream perhaps, or even something like chocolate ice cream to combat the strong peanut butter. It was good, don't get me wrong, but even in the small size, I grew sick of it. I was glad I got the mini size, since I didn't love the peanut butter after a while. White Chocolate Cookie Dough Dip, Skor, Rainbow Sprinkles. Mini. $1.50 + $1 + $0.65 + $0.65. 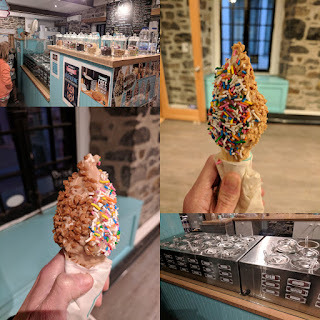 For my second cone that day, I went for the cookie dough (also white chocolate base), since it was clear I was craving sweet. And I added crushed Skor bars (toffee candy) and rainbow sprinkles again because I loved them on the first cone. This one was made by the same person, but came out a fairly different shape. More like a Christmas tree than a perfect cone. The cookie dough dip was a great choice, not that it tasted like cookie dough, but it was sweet and satisfying. Creamy from the white chocolate, and thick, but not intense in the way the peanut butter was. If I lived here and came regularly, I'd get it again, but with limited time during a short stay, I'd rather explore more options. The Skor candy bits though were not good, somehow kinda soft, which was entirely wrong. Every bite I took with them had a really unpleasant soft chew to it. I'm sure that if they were fresher they would be great, as the toffee was good. I loved the rainbow sprinkles again, not just for the looks, but also the crunch. 70% Dark Chocolate Black Coal Dip, Blue Things, Rainbow Sprinkles. Mini. $1.50 + $1 + $0.65 + $0.65. My final visit was daytime, so I went all out and got not just chocolate, not milk chocolate, not dark chocolate, but the 70% dark chocolate. And went for the charcoal flavor, without trying it. This cone was thinner and taller, and not quite so straight. Mine was much better made than the others in front of me though, they also all had minis, and theirs were all seriously slanting! I added the rainbow sprinkles because they were so good on the other cones, and, uh, randomly, the blue things that I couldn't identify. The crunch from both was great, but they really were just sweet things. The dip was ... ok? It just really wasn't very intense chocolate. Far more chocolately than your average ice cream shop waxy dip obviously, but certainly not as intense of chocolate as you get at the other dip shops around town that truly are real chocolate shops. I've somehow managed to fly this route two more times, without publishing my reviews. Read on for my February AND July 2018 experiences, or go start with my first review of this route in 2015, or updates in 2017. 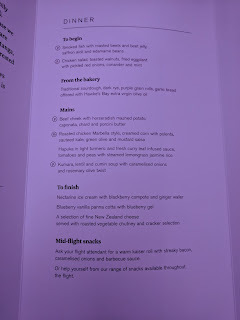 Spoiler: Air New Zealand does make some fabulous food, it surprises me, really. Just, not the breakfast carbs. Most aspects of this flight were the same as previous, but one thing here was a clear winner. Dinner was good. Very, very good. Great wine, wonderful smoked fish starter, shockingly good main, fabulous ice cream. The menu followed the same format as every other Air New Zealand dinner flight I've been on. No surprises here. A choice of two starters, neither vegetarian. A choice of 4 mains (one red meat, one chicken, one seafood, and a token vegetarian soup). Bread from "the bakery". A choice of cheese, ice cream, or another dessert. Some kind of hot roll anytime. Warm kaiser roll with streaky bacon, caramelized onions and barbecue sauce. Every dish was actually shockingly good. As before, main dish orders were taken as soon as we got underway. Then our tables were prepared with a tablecloth, starters and bakery were served from the cart. Refresh bakery and wine was offered after the starters. Main dishes delivered one by one as they were ready. Dessert orders taken individually and brought out right after dishes were cleared. Man of War Wine & Nuts. 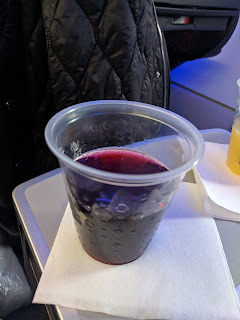 I tried the Sauvignon Blanc on my previous flight, and Chardonnay on the one before that, so it was time to move on to reds. I actually thought I picked a syrah, but when I asked about it more, a different FA told me it was a random blend called Man of War. When I tried to look it up later, I found out that Man of War *is* a New Zealand wine maker, but, they make many wines. It could have been a syrah. Or a blend. I have no idea. The wine was actually quite good, not too tanic, had some complexity. I enjoyed my selection, the best I had on this trip. 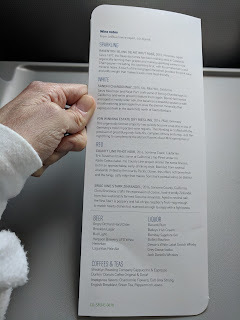 The nuts were the same as my SFO-AKL flight, just simple mixed nuts, almonds, hazelnuts, walnuts, cashews, salted. No nuts I really like though, like brazil nuts, macadamias, or even pecans. 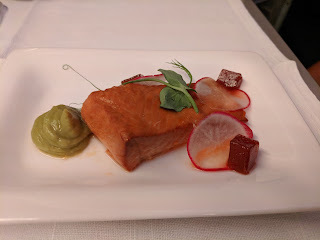 "Hot smoked salmon salad with avocado and horseradish cream, pear jelly and radish." The choice of starter was a no brainer for me, as I dislike chicken and chickpeas and feta. I was skeptical though, as the smoked salmon on the first leg of my journey wasn't great. Well, huh. This wasn't bad. The salmon had an amazing smoky flavor. The texture was perhaps a bit odd, but the smoky flavor was incredible. I was glad to see the avocado was totally not touching the salmon, as I'm allergic, and was worried that I might need to forgo the starter entirely. I was sad to miss out on teh horseradish cream though, as it was blended. The sliced radish was pretty but a bit random, but the pear jelly cubes were fantastic! Super flavorful. And they didn't really taste like pear, but just a nice deep sweetness, that actually went really well with the salmon. Such an odd dish, smoked salmon and pear jelly, but, I liked it far more than expected. Only thing missing for me was the creamy element, but that is only because I had to skip it. "Lamb and oregano burger with griddled halloumi cheese, beetroot relish, tomato and cucumbers salad served with mint aioli." For mains, I was stumped. I certainly didn't want chicken, although maybe it was worth ordering for the sides (what is tamarillo?) I doubted the salmon would be good, but smoked tomato fonduta sounded interesting, and, mashed potatoes could be good. I didn't want the soup, because, meh, soup. I did want halloumi. I did want aioli. But, uh, a lamb burger? I don't like lamb. 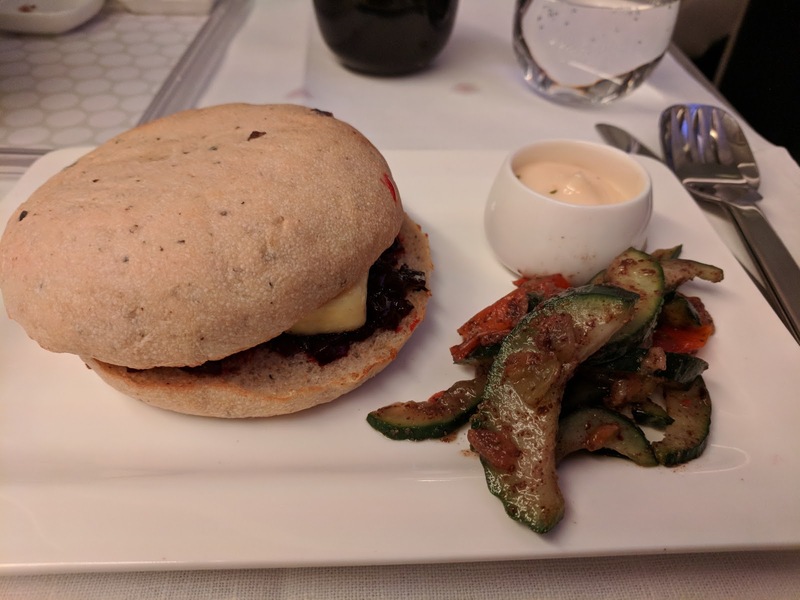 So, I ordered the lamb burger ... without the lamb. I knew it would be assembled to order, and they could actually do this. 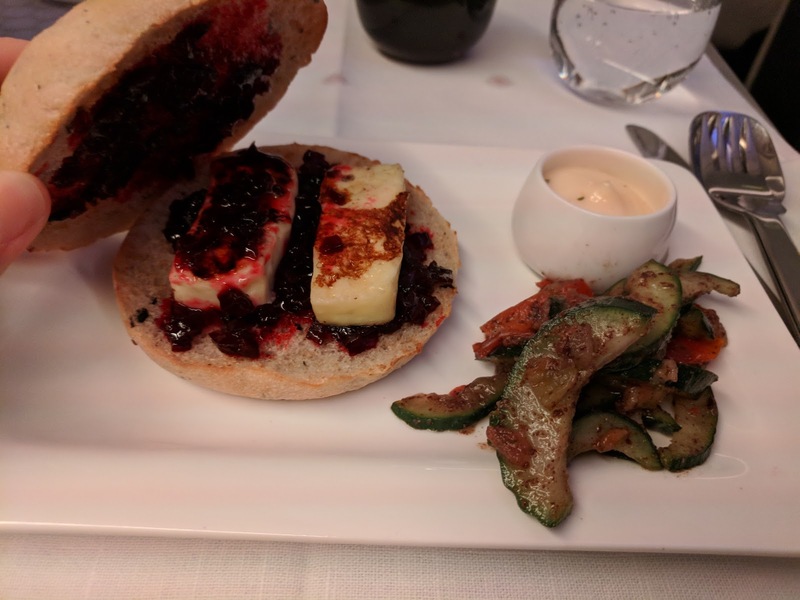 I figured I'd eat the halloumi out, try the relish and aioli, and move on. I didn't actually need dinner at this point anyway. Except, it turned out to be really quite good. The roll was an olive roll. It was warm. It wasn't dry or stale. It was flavorful. It was, well, good. Maybe I wouldn't have loved it just plain, but with toppings? Yes! It was slathered with the beetroot relish on both sides. This too was good. Juicy, flavorful. Beet and olive was a nice combination. The relish combined even better with the mint aioli. The mini aioli was fantastic. I literally finished the entire pot. I literally just ate aioli, but the spoonful, at the end. I literally dipped pieces of bread into it. I can't say I tasted mint, but it was creamy, garlicky, and really quite excellent. 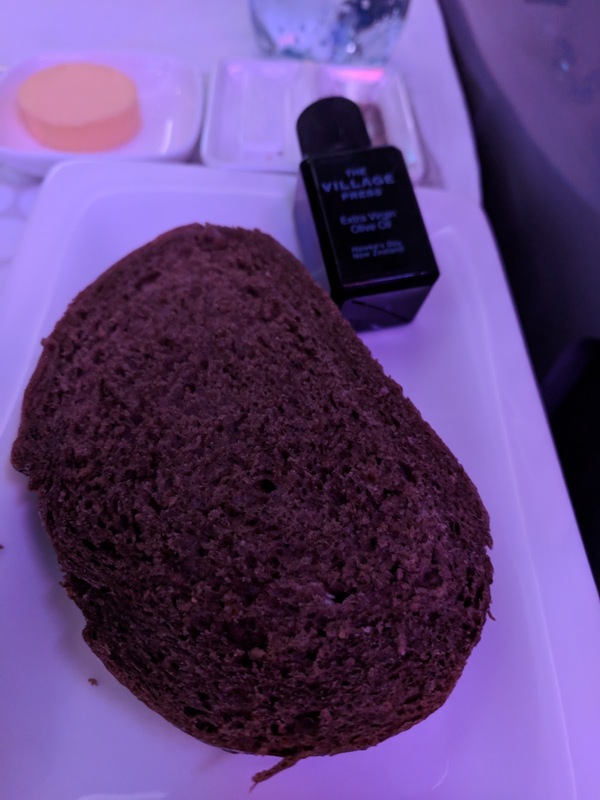 The bread, with beetroot relish, and aioli, was truly tasty. I was beyond shocked. And then, halloumi. Normally the burger comes with one piece, but they gave me two. It was decent. Not too squeaky, with grill marks. Sure, reheated, but, not bad. Bread + spreads + halloumi worked fine, btu I preferred the halloumi with some beetroot relish on its own, and the bread with beetroot relish and aioli on its own. I didn't care for the tomato and cucumber salad, it had strange spicing and the cucumbers were soggy, but, I didn't really mind. Overall, this was shockingly good, and I was thrilled that I decided to order it. "Gourmet dessert of triple chocolate ice cream with caramel sauce and coconut inclusions." For dessert, I didn't want the tart, so I opted for the ice cream, even though chocolate, and even though evening. 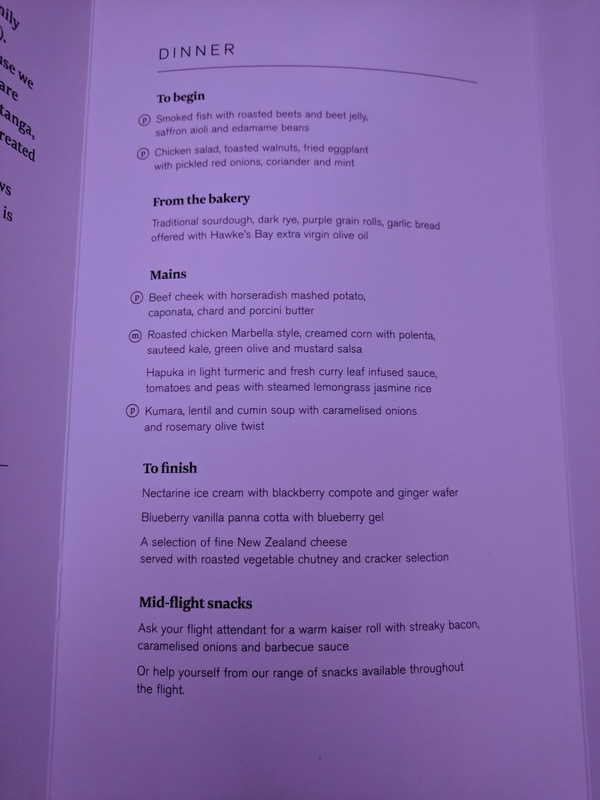 As per Air New Zealand style, it was Kāpiti brand, and came with a sauce (caramel) and topping (menu said "coconut inclusions", but was "chocolate cookie crisps"). "Rich and velvety chocolate flavoured ice cream blended with real chocolate pieces and a swirl of decadent chocolate sauce for a taste explosion. " It was really quite good. Really rich, creamy, chocolate ice cream, with chocolate chips. Not served too frozen. Not icy. Wow. The caramel sauce was sweet and well applied, not too much, not too little. I liked it quite a bit. Overall, this was really quite good. I'm glad they source decent New Zealand ice cream. Get yourself started with an all natural mango smoothie or your choice of juice. 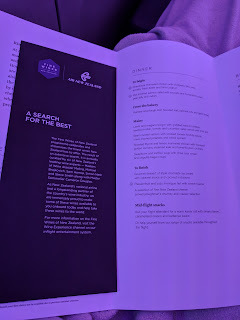 Breakfast service was as all my other Air New Zealand flights. No pre-orders taken before sleep. Just a little over 2 hours before landing, smoothies and juice are brought around. Main dish orders are taken shortly after. A bite later, a cart comes through the aisle with the "pantry", served to order. Then, a basket with the "bakery". Finally, the main dishes are delivered one by one as they are ready, one type of entree at a time. Breakfast wasn't amazing, but, I enjoyed what I had. I skipped the juices, and went right for coffee and sparkling water. The coffee was fine, not amazing, but, I didn't need to add sweetener or anything. 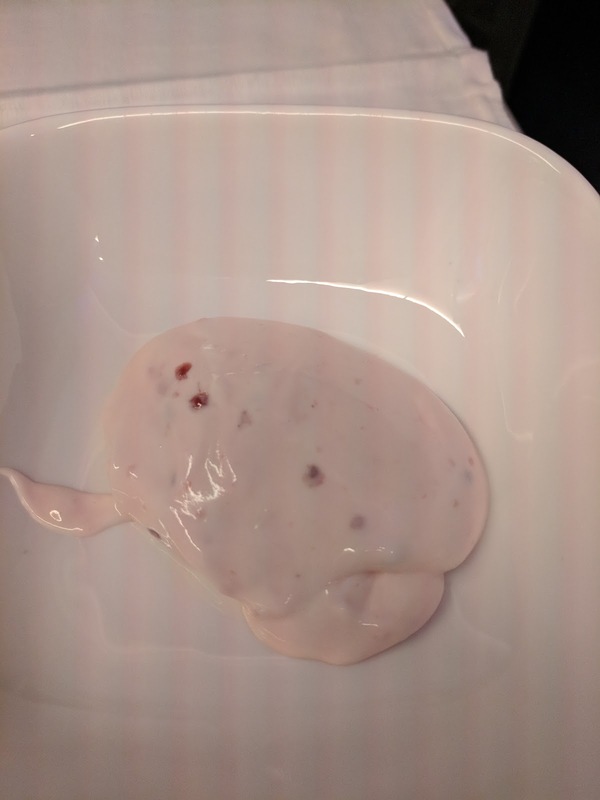 The fruit salad had melon (I'm allergic), and I've never cared for these cereals or yoghurts before, but I still decided to try a little of the berry yoghurt, hoping it would be like the amazing yoghurt I had the whole time I was in Australia (at the hotel, in the airport lounge, etc). It wasn't though. It was just berry yoghurt. Thicker, creamier than what I am used to in the US, but, not very good. From the "bakery", I was presented a basket as always with the toast and spreads, plain croissants, and assorted danish. 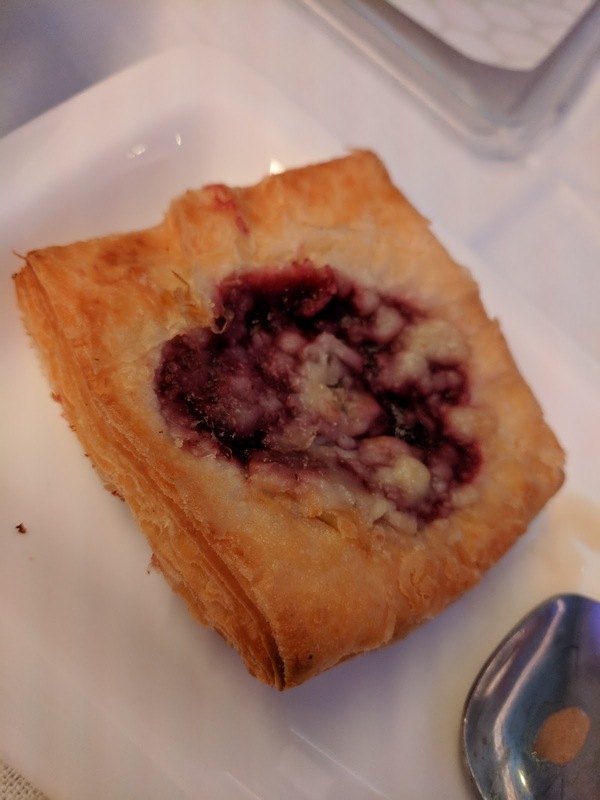 I went for the berry one, not because the danishes have ever been amazing, but because it looked really nicely filled with berry jam and a crumble on top. The danish wasn't as warm as others have been. It wasn't as crispy on top. Like all others, it wasn't flaky, it wasn't buttery, it wasn't a good baked good. And yet, like many others, I did enjoy it, although I didn't care for the dried out edges. The berry filling was as generous as it looked. There was tons of it. It was sweet and fruity, and there was a bit of crumble on top. The filling was really decent. Or maybe I was just in the mood. "Cranberry, currant and chia waffles with vanilla yoghurt, blueberry chia compote and sweet syrup." 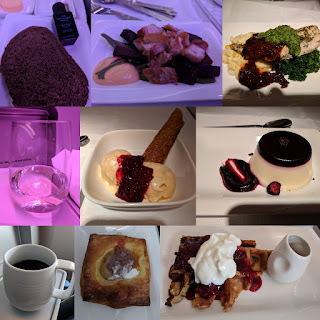 Air New Zealand has never made good waffles, pancakes, or french toast. I keep trying them. 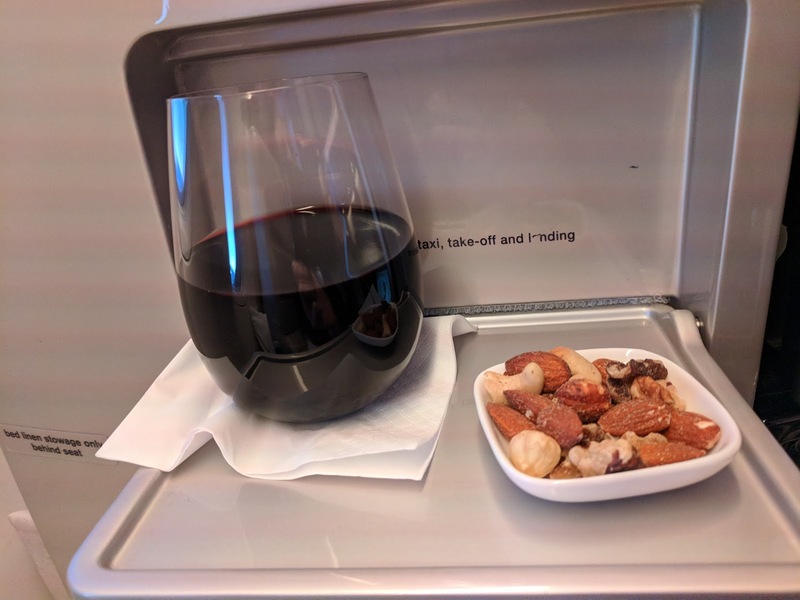 Because I have had good versions on other airlines (like the actaully good liege style pecan waffles with sautéed bananas and cinnamon honey served in British Airways first class). And, um, I have a label on this blog just for waffles. Plus, with such an excellent dinner, I thought perhaps the person running the galley on this flight just had the magic touch. I tried to look past the fact that the waffles would have chia, cranberry, and currants (meh! ), and yoghurt not whipped cream, and even the compote was going to be filled with chia. I still had a glimmer of hope. I shouldn't have had hope. 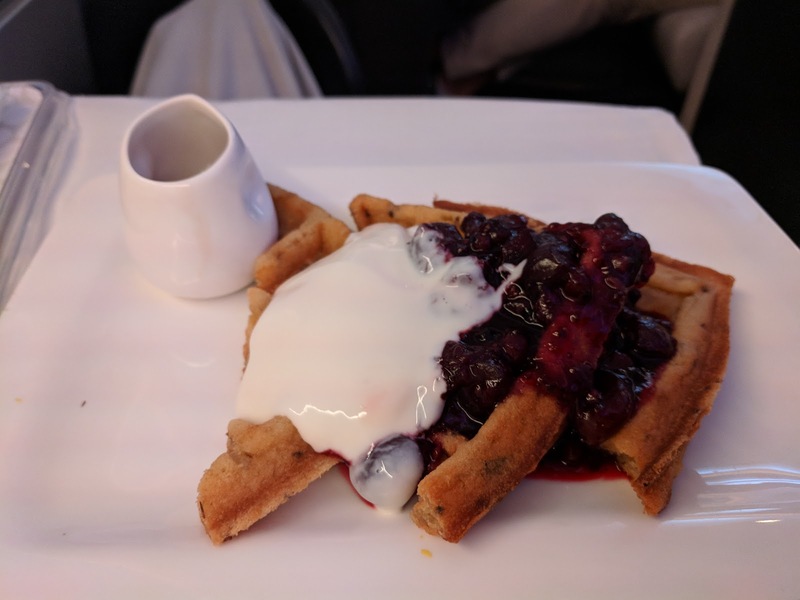 The waffles were just as bad as every other Air New Zealand breakfast carb dish. They were soggy and dried out at the same time, particularly the edges. Where the compote was was a soggy mess. 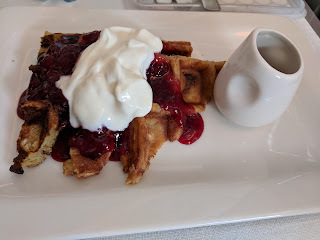 The cranberries and currants didn't really seem to be in the waffles, but rather in the compote on top, which may have also had blueberries as described, I couldn't quite tell. The compote was actually not bad. Fruity, sweet, balanced. The yoghurt too was not bad. Lightly sweet, slightly vanilla, and it went nicely with the fruit compote. Creamy, not tart. I liked it more than the yoghurt served earlier in the meal. The syrup was the same as my prior flight, not maple syrup, just sweet syrup. I salvaged the yoghurt and compote from this this, and enjoyed it with my danish, and I am still glad I picked it over the other options, but, still, not good. My July flight was equally successful. The flight itself was nice. Not much turbulence, lovely staff. And the food? Again, very good. More good wine, another tasty smoked fish starter, fabulous ice cream, good panna cotta, decent breakfast. 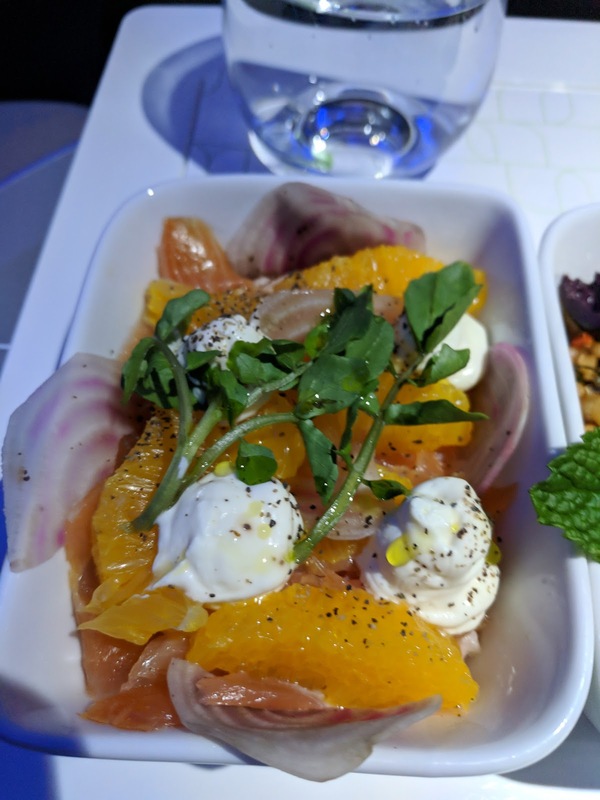 Air New Zealand really does do some shockingly good food on board. 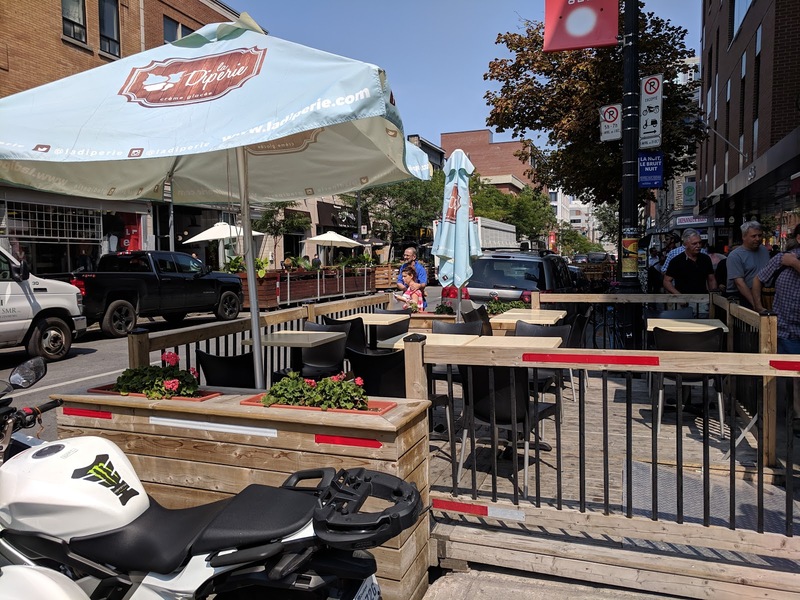 Menu format is as always, choice of starter (fish, chicken), main (fish, chicken, beef, or soup), and dessert (ice cream, cheese, or panna cotta). Those with special diets (including vegetarian) should pre-order in advance. Smoked fish with roasted beets & beet jelly, saffron aioli, and edamame beans. Chicken salad, toasted walnuts, fried eggplant with pickled red onions, coriander, and mint. Traditional sourdough, dark rye, garlic bread, purple grain roll. Served with Hawke's Bay extra virgin olive oil. Beef cheek with horseradish mashed potato, caponata, chard, and porcini butter. Roasted chicken Marbella style, creamed corn with polenta, sauteed kale, green olive and mustard salsa. Hapuka in light turmeric and fresh curry leaf infused sauce, tomatoes and peas with steamed lemongrass jasmine rice. Kumara, lentil, cumin soup with caramelised onions and rosemary olive twist. Nectarine ice cream with blackberry compote and ginger wafer. Blueberry vanilla panna cotta with blueberry gel. Fine New Zealand cheese served with roasted vegetable chutney and cracker selection. My choices were pretty easy for the savory. 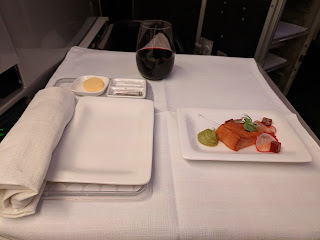 Air New Zealand often has incredible smoked fish, and I don't like chicken, so, the smoked fish starter it was. 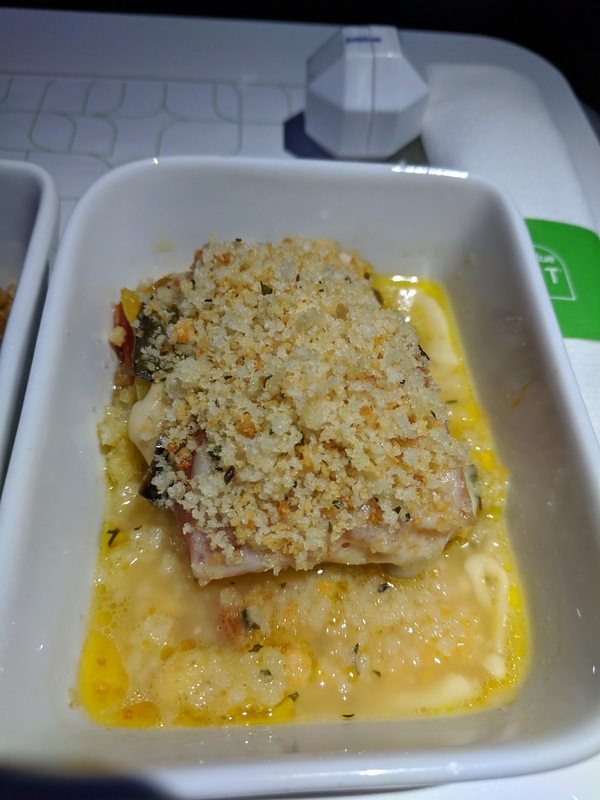 For the main, I have no hope for the cooked fish on flights, always dried out (and eh to rice and peas), and I certainly didn't want lentil soup. This left the beef cheek that sounded fairly promising (horseradish mashed potato! porcini butter) or the chicken. Now, you can say, "Uh, you don't like chicken, how was this a thought? ", but the thing is, I really like polenta, creamed corn, and kale, and I knew it would come smothered in Marbella sauce. Chicken it was. For dessert though ... I was so, so, torn. 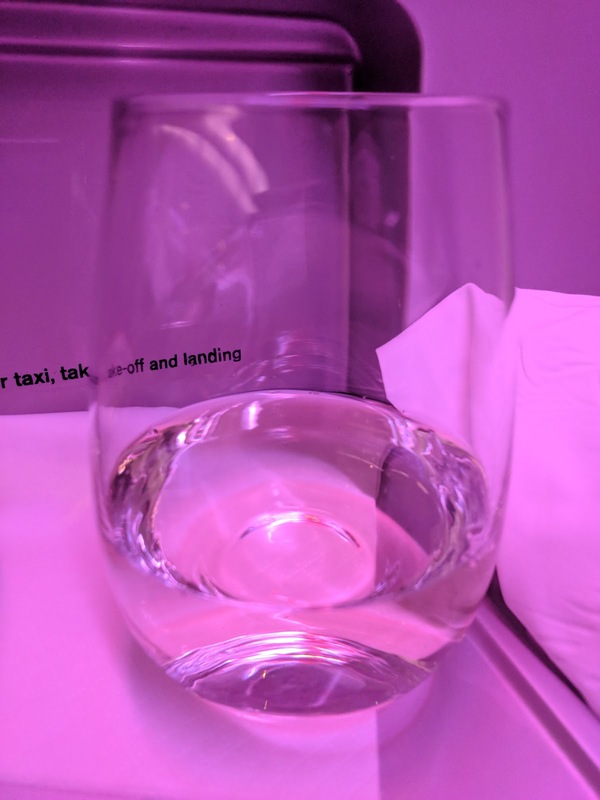 Just like on my flight from Sydney to Auckland. I love their ice cream. This one sounded great too. But ... the other option was panna cotta! I also love panna cotta, hence the blog label for that too. 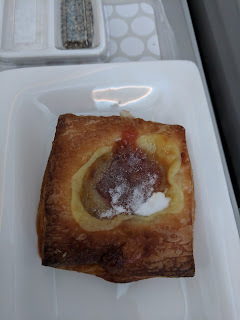 Although, I've had "panna cotta" on these flights before, and, um, they weren't really panna cotta. Spoiler: I got both, and I didn't even really need to ask! As always, our drink orders were taken before takeoff, so that drinks could be served soon as we got underway. They came quickly, paired with nuts. 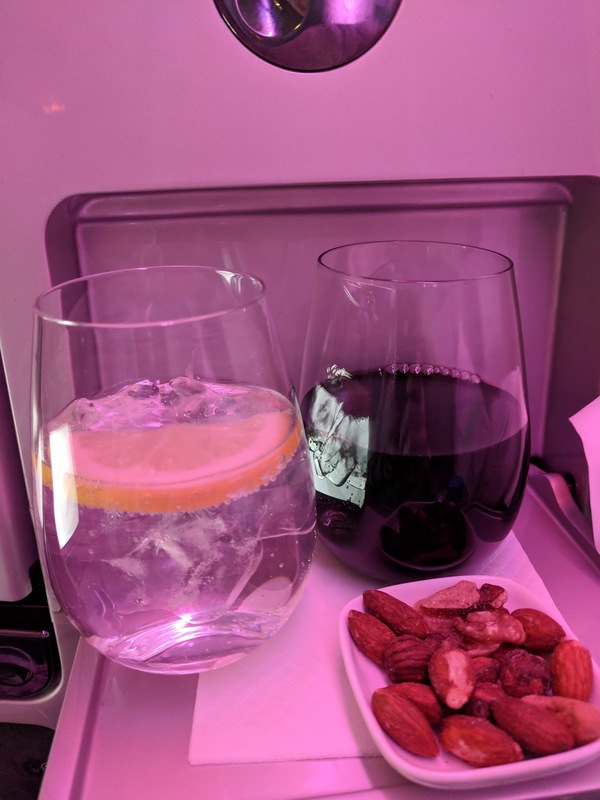 Sparkling Water / Pinot Noir / Nuts. 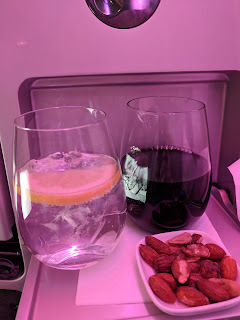 I pondered my drink choice quite a bit, as Air New Zealand has such fabulous wines, and I loved the Sauvignon Blanc on my previous flight , and was tempted to just have more of it. But instead, I opted for red, just to mix it up. I had two choices, pinot noir or merlot, so, pinot it was. I asked for a small pour, but, certainly got a full glass, not quite what I was hoping for. It was ... more tannic that I really liked. In the way that has some bite. Still a good wine, nicely complex, but, too tannic for me. I wished he had really given me the small pour I wanted. I eventually just went back to galley and asked to trade it out, which seemed easier. The FA back there was very friendly, offered to let me try the other red (Syrah), and gave me a tiny pour. I'm glad he did, as I didn't like it either (too acidic). On the side was mixed nuts, not warm, but a nice selection including walnuts, almonds, hazelnuts, and cashews, although primarily almonds. They were nicely roasted and salted, enjoyable to munch on. Since the reds clearly weren't doing it for me, I swapped over to white, and went for the Sauvignon Blanc, since I generally enjoyed theirs. It was fine, not too acidic, not too sweet, but again a bit minerally. "Smoked fish with roasted beets & beet jelly, saffron aioli, and edamame beans." As standard, the starters come served from the cart, which comes through the aisle with additional drinks, bakery, and, your choice of chilled starter. I was pretty excited for this one, since they often have fabulous smoked fish, and, um, I love aioli! The fish was lightly smoked, not as smoky sadly as some of my previous flights (including the one I had just gotten off of), but still decently smoky, nice firm texture, not fishy. A nice, simple, clear protein. It came plated with edamame (eh, not my thing but they were cooked fine), roasted beets (the rectangular pieces, eh as I don't like beets), beet jelly (the little squares, fascinating, not much beet flavor, kinda fun I guess), and saffron aioli (ZOMG) on a bed of rather wilted greens. The aioli was amazing. Sure, I always like mayo/aioli, but this was really quite flavorful, and perfectly creamy. Plenty of it, and I used it all. I enjoyed this. It wasn't the best smoked fish I've had on Air New Zealand, but, it was quite good, and I was happy with it. From the Bakery: Dark Rye. had stopped having bread on flights in general, and the wonderful smelling garlic bread on Air New Zealand never did it for me, but, I had a vague memory of trying the dark rye and liking it, which is very not normal for me, so I tried it again. I'm glad I did. Slightly warm, not stale, and really a lovely flavor. If I'm ever really feeling the desire for some carbs, this satisfies. 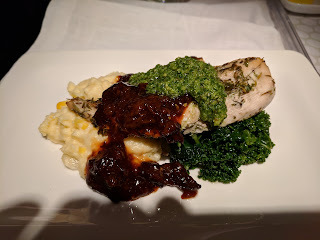 "Roasted chicken Marbella style, creamed corn with polenta, sauteed kale, green olive and mustard salsa." I ordered this for the polenta and sauce. And kinda for the kale. And fascination with the idea of the relish. It really was plated up nicely. The chicken looked relatively moist and covered in herbs, and if I liked chicken at all, I would have tried it. The polenta and creamed corn mix was ok. Fairly creamy, and nice to have the texture of the corn in the polenta, but it wasn't anything special. Maybe I just wasn't very hungry. The kale was not good. It looked great, but, it was really really bitter. Also salty, but I like salt. I tried a few pieces, and, although really nicely cooked, crisp, not mushy, the flavor just wasn't good. I also did not care for the relish on top, and I do not think it was "green olive and mustard" as advertised, as I didn't taste either, and this was just really herby. Somewhat soapy. Not for me at all. But the marbella sauce was really flavorful, sweet and savory, and I really liked it. I was glad it was smothered in it. Good texture from some chunks of fig/prune/something. I loved it with the rye bread too. So, overall, I think this was done fine, but I wasn't really that hungry. I appreciated the flavorful marbella sauce though! To Finish: Blueberry vanilla panna cotta with blueberry gel. After the meal, I was offered dessert, and I said "yes!" 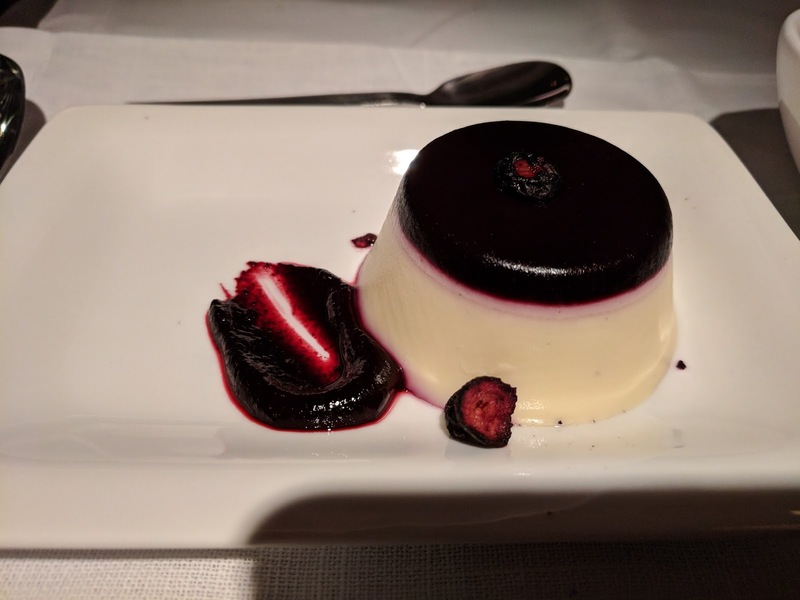 My FA asked which I wanted, and I asked about the panna cotta, asking if people liked it. My FA said it was new, so he didn't really know. 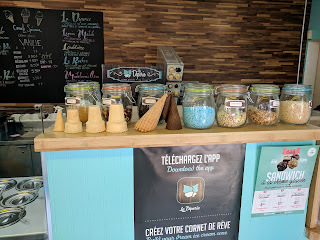 I said I love the ice cream, but I was tempted. He very quickly said, "Why not both?" I liked his style. The panna cotta was nicely set, and had a lovely vanilla flavor. Excellent panna cotta, better than many I get at restaurants, and certainly better than any I've had on a flight or in a lounge. The layer on top I didn't like, a blueberry gel, firm, eh. Amusingly, I saw others return their plates with just that layer remaining too, so I wasn't alone in this thought. On the side was another blueberry sauce, sweet, fine, better than the gel, but I didn't actually want it, the panna cotta had a great flavor on its own without it. There were also a few dried chunks of blueberry. Overall, excellent, and I was happy with just this choice, actually. Creamy, satisfying, well sized dessert, certainly a full dessert, but not overwhelming. To Finish: Nectarine ice cream with blackberry compote and ginger wafer. But of course, I also had the ice cream, again Kapiti brand, from New Zealand. It too was actually really, really, really good.. This time it came topped with blackberry compote, and with a big huge ginger wafer on top. 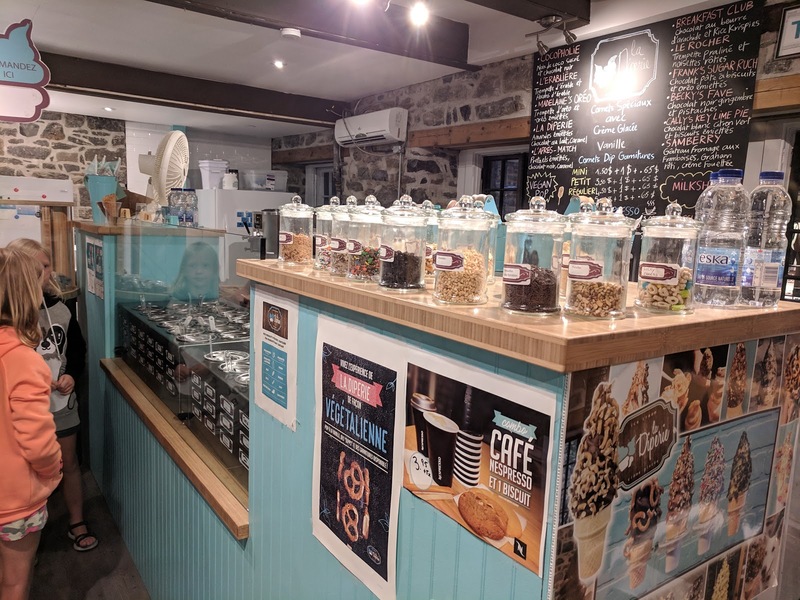 "Ice cream made with succulent Central Otago nectarines and rich muscovado style pieces folded through to create a seasonal taste sensation." The ice cream was perfectly creamy. No icy bits. Quality ice cream. The nectarine flavor was incredible, really really deeply infused, and quite enjoyable. Wow. I was blown away by the ice cream flavor. I think my favorite of all the ice cream I have tried on board so far. On top was "blackberry compote", that seemed exactly like the blackberry and apple sauce that came with the lackluster mascarpone "parfait" on my prior flight. I wonder if it was the same? I wasn't into it, but I'll admit it went well with the nectarine. And then, that "ginger wafer". Wow! It was a huge, crispy, sweet tuille. I loved it. So sweet and crispy. Intense ginger flavor. Great flavor, awesome texture. Overall, also amazing. I was also perfectly happy with this choice, and again, a very reasonable sized dessert offering, 2 full scoops, and that giant cookie. 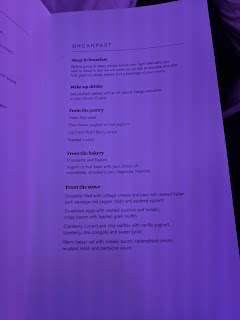 The breakfast menu, and service, were nearly identical on my next journey. 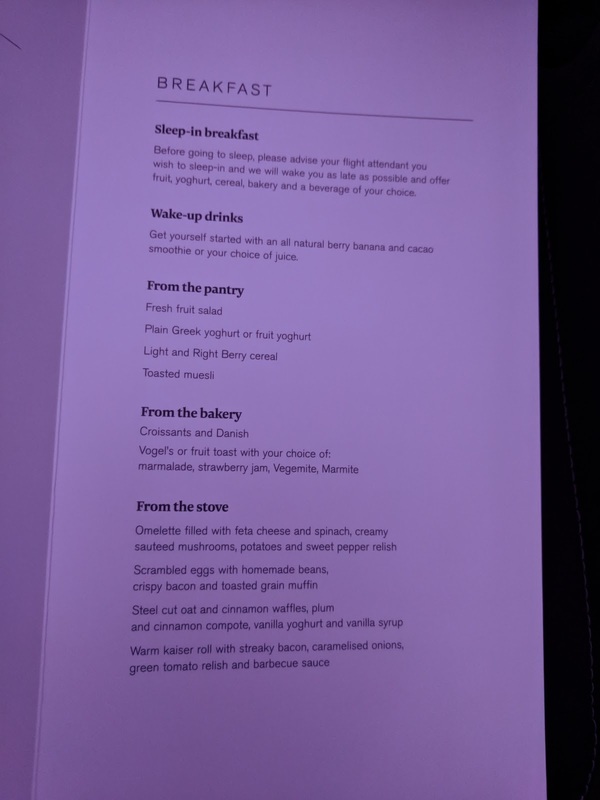 For the main, a choice of omelette, scrambled eggs, waffles, or the exactly same bacon roll. Only the sides/fillings/toppings changed. Get yourself started with an all natural berry banana and cocoa smoothie or your choice of juice. Omelette with feta cheese and spinach, creamy sauteed mushrooms, potatoes, and sweet pepper relish. Scrambled eggs with homemade beans, crispy bacon, and toasted grain muffin. Steel cut oat and cinnamon waffles, plum and cinnamon compote, vanilla yoghurt and vanilla syrup. Warm kaiser roll with streaky bacon, caramelized onions, mustard relish and barbecue sauce. After giving everyone about 20 minutes to use bathroom and wake up, a cart came through the aisle with the "Pantry": yogurt, fruit, cereal, same selection as always, which included melons in the fruit, to which I'm allergic. As this was also just 6 hours after I had finished my last, huge, meal, and it was 5am in my world, I wasn't exactly hungry, so I just skipped the course, knowing it was always lackluster. For the main, I was fairly torn. For one, I wasn't hungry. But also, none of the choices sounded very good. I don't like omelettes, but, spinach and "creamy" mushrooms sounded good. 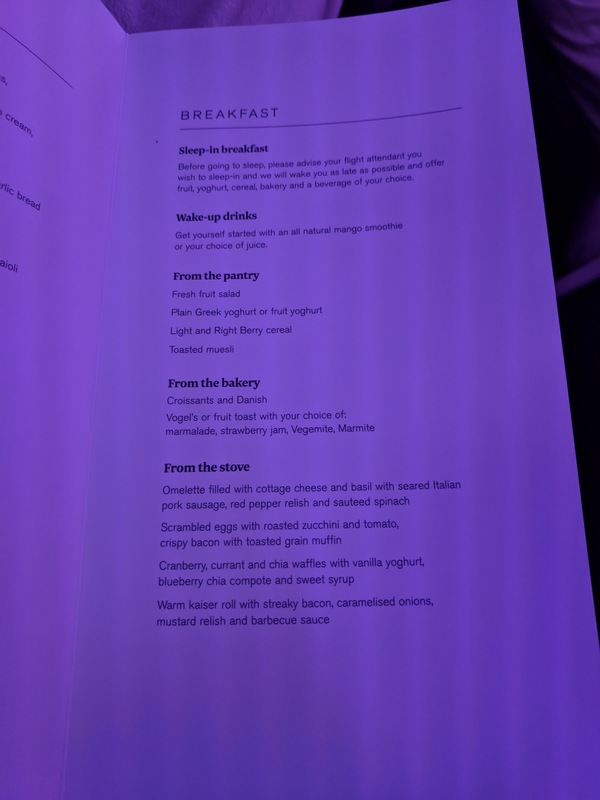 I don't like scrambled eggs, but I know they do decent poached eggs, and maybe a "grain muffin" was interesting? 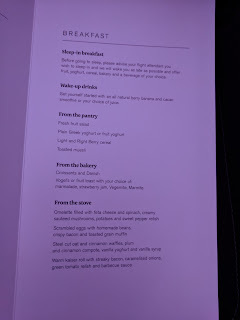 Of course I adore waffles, but, I've never once had even remotely decent waffles, french toast, nor pancakes on Air New Zealand flights (sorry, ANZ, I really love a lot of your food, but the breakfast sweet carbs are always fairly awful). I've had some really great breakfast sandwiches on their flights, but, this one had no cheese, and a boring bun (kaiser roll). So hard to pick! I settled on the waffles, which I enjoyed, but I did have a little omelette envy, as it truly did look good, with a side of really creamy looked mushrooms, just as advertised. Smoothies, juice, and coffee were offered as the cabin sprung into action 2 hours and 20 minutes before landing, staff eager to convert your bed into a seat, and get the show on the road. 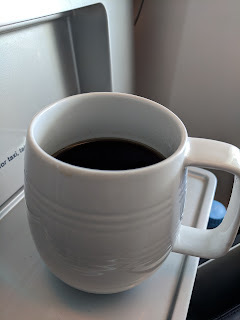 I skipped the juices and smoothie, but had a cup of coffee, black. It was fine. Soon after the "Pantry" cart, a basket came by the the "Bakery". The selection of the day was croissants, fruit toast, and two types of danishes, berry or apricot. I haven't seen apricot before, so, I opted to try it. It was warm, which was great. The filling was actually pretty good, sweet fruit, decent apricot flavor. But the danish was not good. Sometimes they are actually decent, flaky, crispy, but this one was soggy and super oily. 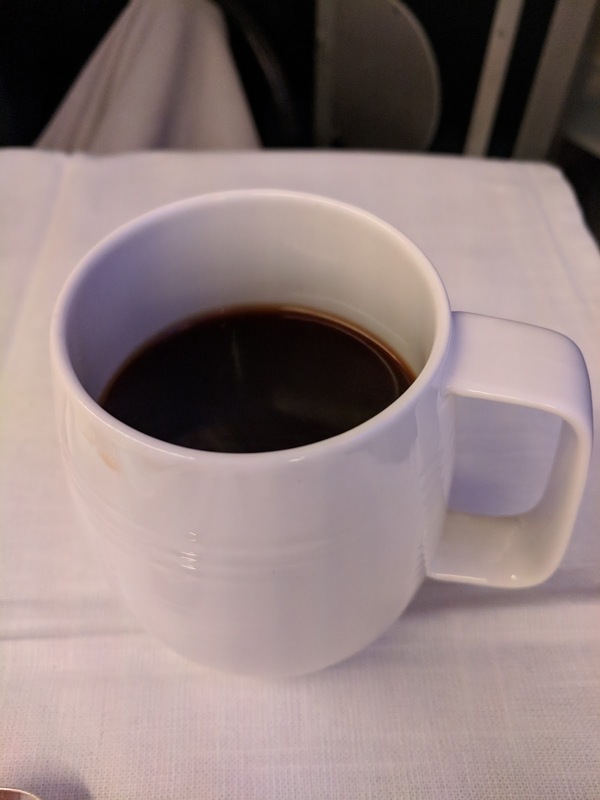 To go with my main, I moved on to decaf coffee. Or, I tried to. When I ordered it, it was no problem, the FA said he just needed to make it. But ... then he came back to let me know that they actually didn't have any (!). I asked for hot water instead, and hoped that I could dig up a instant decaf from the depths of my bag. Finally though, he did come back, and not with hot water. 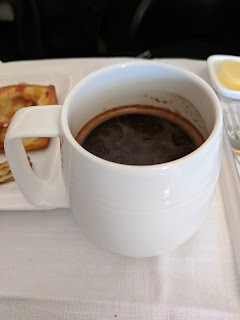 He found decaf in economy, certainly just instant, but, heh, that's all I was going to make too. It was ... fine? Needed sweetener for sure. "Steel cut oat and cinnamon waffles, plum and cinnamon compote, vanilla yoghurt and vanilla syrup." I took a gamble and went for the waffles, based on three things: 1) I wasn't hungry, so if I didn't actually like it, no big deal, 2) Literally no one was ordering the bacon roll, so, they might know something I didn't, but, also, there would certainly be plenty left if I really wanted one, and 3) I've actually enjoyed the vanilla yoghurt and fruit compote from the breakfast carbs before, if nothing else. These were the most successful waffles/pancakes/french toast so far. But ... the waffles were still soggy, not crispy, not lofty ... so not actually good waffles. But they were hot, and I really did like the hearty nature to them from the oats. A nice flavor, even though the texture was off. The texture wasn't really that noticeable though, as they were smothered in toppings. 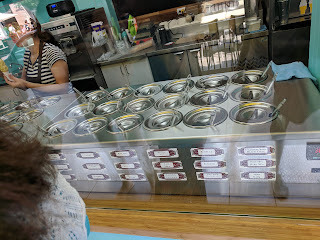 The vanilla yogurt was again really quite tasty, very sweet, runny style, so not what I'd want a bowl of, but the amount there was quite delightful, almost like having a really loose sweetened cream. The fruit compote was also quite tasty, plum and cinnamon compote, loaded with bits of fruit, also quite sweet, but, really enjoyable. There was tons of it, and together with the yogurt, it was lovely. It soaked into the waffles extensively, so their soft nature didn't really matter. And finally, a tiny pot of "vanilla syrup", just really sweet pancake syrup, tasty, but not needed for the waffles since it was already so coated in other toppings. So, somehow, my 5am, not hungry self essentially polished the waffles off, and did actually enjoy the toppings. Finally ... basically success at hot breakfast carbs? Departure: JFK, 8:07pm (scheduled), ~8:40pm (actual). 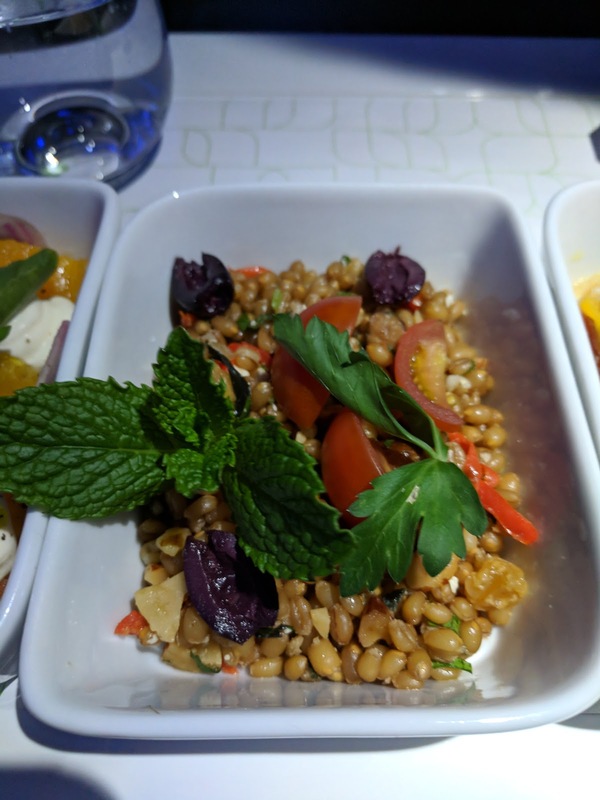 I've reviewed Mint extensively before, so, no full review this time around. Not much has changed, as always, a wonderful experience, both hard product and soft. I was seated in 3D, aisle seat at least, with a neighbor. I'm always shocked by how different the experience is in the single suites vs having a neighbor. It doesn't really matter how nice that person is, the lack of storage space really is just dramatically different. Basically ... just the little pocket in seat in front of you, no place for bag during takeoff/landing, etc, compared to the huge cubbies in the suites. Just a small shared place for drinks. Etc. But, it was still Mint, at least. 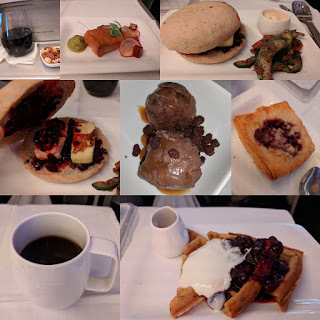 Dining on this flight was fine, but lacking any standouts. 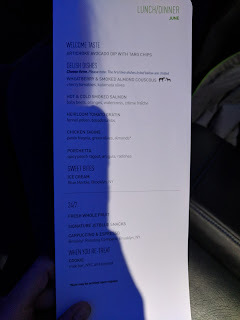 As always, menus were distributed as we settled into our seats, orders taken once underway. The menu followed the familiar format - appetizer, choice of 3 of 5 small plates (2 chilled, 3 veggie, 1 seafood), and local ice cream. ICE CREAM: Blue Marble Ice Cream, New York, NY. This was a pretty unexciting menu for me, the first time I think I've ever *not* been excited about the lineup. 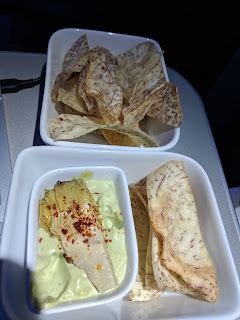 Not a single dish was one I really wanted, and, I knew I was allergic to the starter dip that went with the amazing taro chips, which made me pretty sad, as I adore their dips! And of course, a drink list with the usual beer, liquor, coffee, tea, and wine, the exact same lineup I had on my flight to the east coast. Country Line Pinot Noir, 2016. Pre-takeoff, as always, drinks were offered, and I decided to just move right to red wine. It was one of those days. 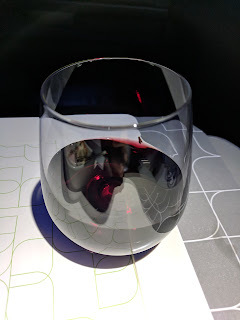 The only red option on the ground was the pinot noir, which was fine with me, given that I had liked it before. It was again fine, very drinkable. Broc Vine Starr Zinfandel, 2016. The pinto really was fine, but I decided to try the other red wine, a zin, just to mix it up. It was a much bolder wine, a lot more bite, a lot more complex, but, not tanic, and I liked it. The pinot was certainly more likely to be a crowd pleaser, light, drinkable, but this was much more interesting. Welcome Taste: ARTICHOKE AVOCADO DIP WITH TARO CHIPS. Our Welcome Taste was delivered once underway. Even though I'm allergic to avocado, I still wanted the taro chips, and, one little bit wouldn't hurt right? I liked the taro chips as always, crunchy, satisfying. As always, I found the serving way too small. And, when I told my FA that I loved the taro chips, she offered without a beat to bring me more and more. The dip was nicely plated up, topped with an artichoke heart and topped with some kind of spice. I did try a bite of the dip, and it was creamy and flavorful, herby too, but, alas, I felt the effects of the avocado nearly immediately, so, I stopped. And I didn't really want the artichoke heart anyway. For my meal, I went for the two chilled dishes, and the hot vegetarian dish, ruling out the chicken and porchetta. My neighbor selected the same dishes, so, I didn't get to spy on the ones I didn't order. 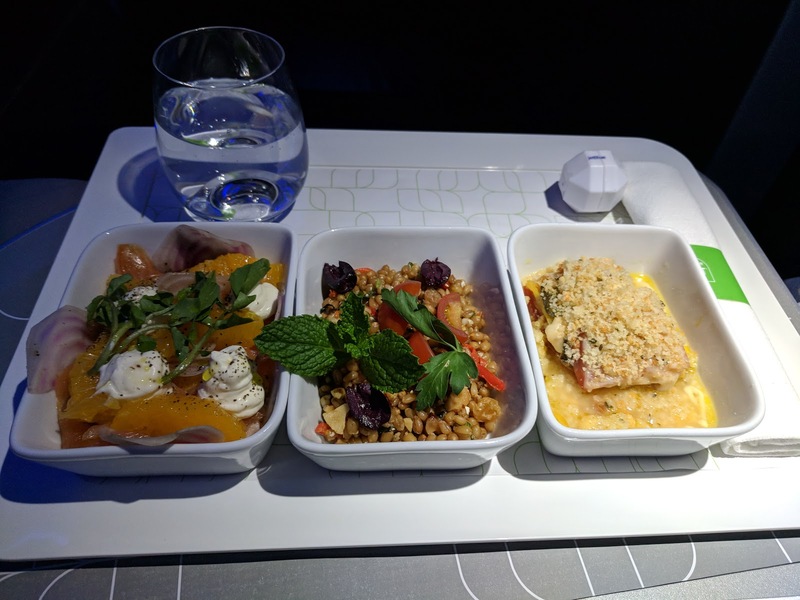 My tray arrived with all three of my small plates. This time I finally remembered to say that I didn't need a roll. WHEATBERRY & SMOKED ALMOND COUSCOUS (Chilled). First up, a chilled "salad"
If you like healthy grain based salads, this was a nicely done dish. The wheatberries were cooked exactly as I prefer, still quite al dente, crispy, chewy. Mixed in with the wheatberries was chopped almonds, more good texture and crunch. Also in the mix was I think red peppers and feta cheese? A little more color and pop, following the Mediterranean theme. On top, slices of olives and cherry tomatoes, and mint and cilantro garnish. It was very lightly dressed as well. So, for what it was, a nicely done dish. Good textures and flavors. Years ago, I would have loved this (I was on a healthy kick, and really into wheatberries in particular). These days, it wasn't really what I wanted, but, I can recognize all the good aspects of it. My second pick, but I wouldn't want it again. HOT & COLD SMOKED SALMON (Chilled). "Baby beets, oranges, watercress, crème fraîche." Next I had another cold dish, the smoked salmon. It was really beautifully presented, with the watercress on top, globs of crème fraîche, and colorful oranges and beets. The oranges were even supremed. They were juicy and fresh. But I wasn't really into the orange and salmon combination, so I saved them for last, and just ate them as a refreshing palette cleanser before dessert. The beets were raw, thin slices, pretty things, fresh, crisp. Again, not quite sure about them with the oranges and salmon, but, a good component. The watercress too was fresh and nice. I adored the crème fraîche. Super creamy, and plenty of it. But this *was* a salmon dish, so, where was the salmon? HOT & COLD SMOKED SALMON: Underneath. The salmon was under all the other layers. There was two styles, one hot smoked, one cold smoked. 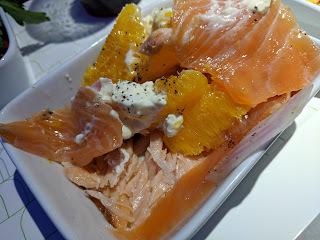 The cold-smoked salmon was thinly sliced, oily, not fishy, slightly smoked, and kinda slimy. Basically, kinda just like lox, exactly as expected, and the style that I don't generally care all that much for. But the hot smoked was great, fully cooked, flaked, really smoky, not fishy, and in the very bottom of the dish. So, overall, some components I didn't like, some elements that didn't combine great, but, some parts that I really did enjoy. 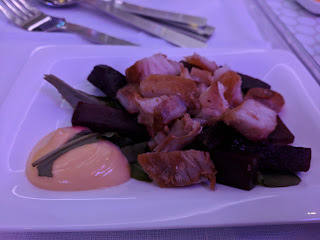 The smoky hot smoked salmon + creamy crème fraîche + fresh crisp beet slices really were tasty. My favorite dish, and I'd actually be happy to get again, just because the hot smoked salmon was so good! My final choice was the hot vegetarian item, a tomato gratin. I wasn't quite sure what to expect with this one, and I'm still not 100% certain I figured out everything that was in it. I liked exactly one thing about it: gooey cheese! Oh, and it was piping hot. But otherwise ... it didn't do it for me. Slices of colorful heirloom tomatoes, yellow, red, orange. Soft but not mushy. But also not very flavorful. Within the layers was a bit of cheese, onions, and some kind of mild green pepper. All ... fine but again, not very flavorful. The real reason I wasn't into this though was the bread crumbs, generously topped, and within. They weren't crisp, and just added a lot of mush to the dish. So much mush. As you can see, it also separated quite a bit, so, the gratin was sitting in a pool of oil, and the cheese was a bit congealed. I never figured out what the cheese variety was (gruyere maybe?). So ... flavorless tomatoes/onions, in oily congealed sauce, with lots of mushy crumbs? Yeah. Not great. But the flavors of congealed cheese were good. 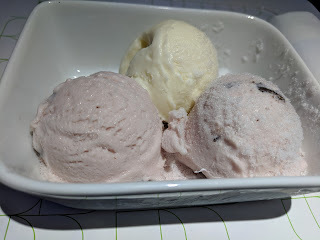 Blue Marble Ice Cream: Raspberry Chip, Vanilla. And ... dessert time! As always, ice cream, served from a local ice cream maker from the port of departure. For NY, this is Blue Marble. Before takeoff, as customary (for me), I asked the FA what our flavor would be. She laughed and noticeably perked up, telling me it was one of her favorites: raspberry chip! Per JetBlue's standard, we received 2 scoops of the flavor of the day, and one scoop vanilla. It always, the ice cream was served way too hard, so I had to patiently wait for it to warm up. It also didn't look great, a bit freezer burned looking. But, once it did warm, it actually was fine. The raspberry chip was indeed a hit, really fruity good raspberry flavor, large size dark chocolate chunks. The vanilla was pretty boring, but, once I loaded on m toppings was fine. Overall, an ok offering. 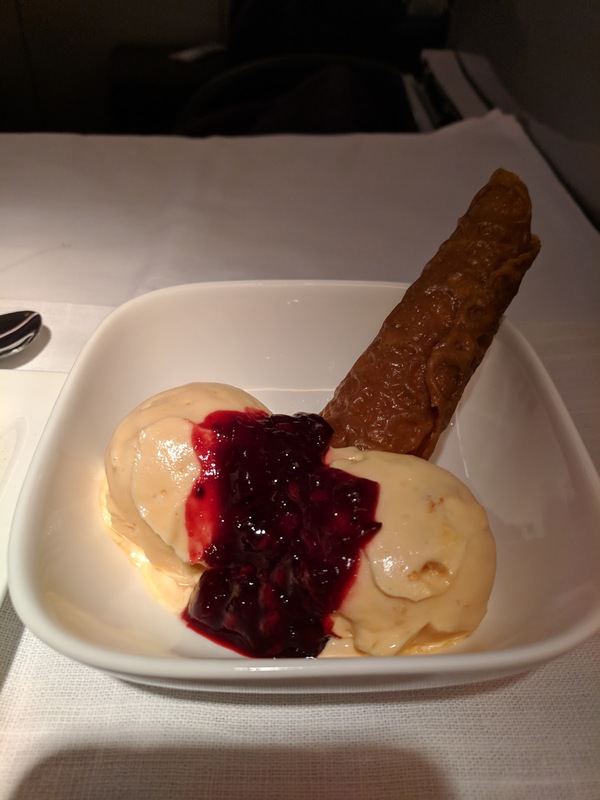 I would certainly prefer creamier ice cream, and other brands I've had on JetBlue have been better, but this flavor was a good one. 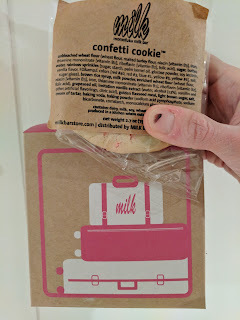 Parting Gift: Milk Confetti Cookie. 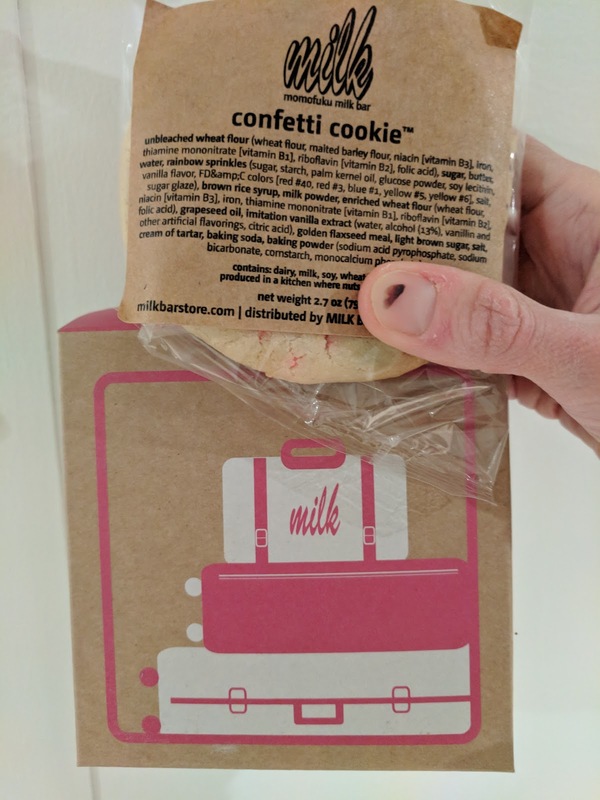 Our parting gift was again a cookie from Milk, this time, confetti.